Explicit The King Varciti Interview. To find out more about King Varciti or Hoodstars, fans can visit his website at hoodstarhiphop.net/kingvarciti, or check out his music on https://soundcloud.com/king-varciti or https://itunes.apple.com/us/artist/king-varciti/id434646907. He also has music videos on his AMG’s YouTube channel, https://www.youtube.com/channel/UCb3IowOMMx-j9L4nEBGSMRg. And for more information about new music releases or live performances, fans can follow him on https://facebook.com/kingvarciti/. 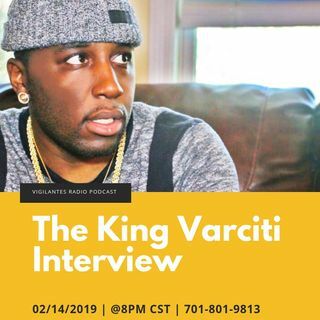 Rapper, King ... See More Varciti, stops by, Vigilantes Radio's "Inside The Music" Series, to chat with Dini about how his journey began in music and the entertainment industry, what separates his talent from others & his plan for breaking into the mainstream industry. To find out, set your reminders, it's happening! 02/05/2019 | @10PM CST | Call in at 701-801-9813 | You can also hop in the mix by visiting www.onlyonemediagroup.com and slapping that "Go Live" button | Please follow our show at www.spreaker.com/onlyonemediagroup & remember sharing is caring! Thanks for your continuous support!